To begin our sewalong, we’ll be giving you a couple weeks to pick out your fabric and gather your supplies. Main Fabric. Dahlia is designed for woven fabrics. For either version, you’ll want a medium to lightweight fabric with a bit of drape to it, such as voile, chambray, rayon challis, or cotton lawn. For Version 1, a flannel or wool suiting would also be appropriate. 14” Invisible Zipper. Both versions require a 14” invisible zipper that will be installed in the side seam. 1/4” Double Fold Bias Tape. Both versions also require 3 yards of ¼” double fold bias tape. You can buy prepackaged bias tape or make your own. Keep in mind that the bias tape will be visible on the finished dress. When choosing fabric for your Dahlia, look for something that has a nice drape and flow to it. Because much of the shaping is done through gathers, you want to avoid anything too thick or heavy, which will not lay very attractively. Version 1 is a cooler weather dress, so a warmer fabric like flannel or wool suiting would be great. Version 2 has a slightly fuller skirt and is sleeveless, so it makes sense to make it in a lighter weight summery fabric like rayon, lawn, seersucker, or chambray. Dahlia was designed with stripes and plaids in mind. There are no darts to visually distort the fabric design, and the seam lines allow for some beautiful pattern matching. The different pieces also lend themselves to a lot of color blocking possibilities. Keep in mind that choosing a stripe or plaid will take a little more work to match the pattern across seams, and you may need to buy a bit of extra fabric to allow for fussier cutting. 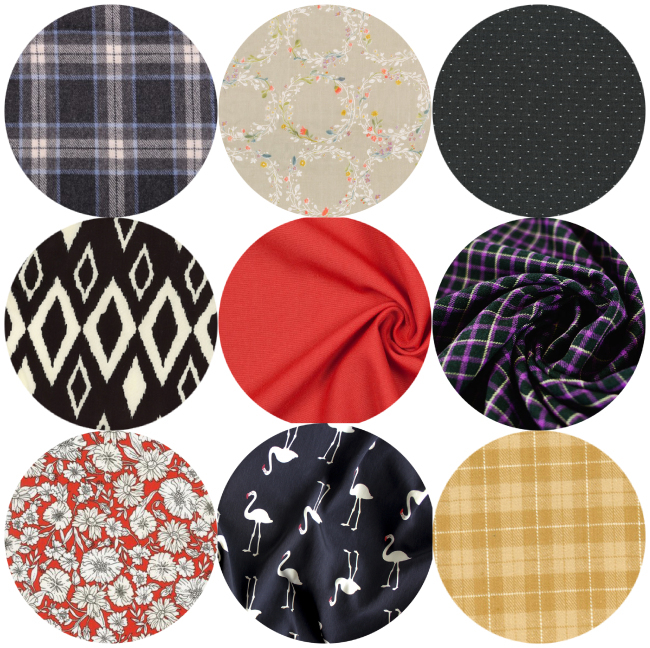 Since one of my favorite pastimes is window shopping for fabric online, here are some different options I’ve come across. I can’t wait to live vicariously through all of your fabric choices! Sewing Shears. Use sewing shears (also called dressmaker’s shears) to cut your fabric. Even if you use a rotary cutter, it’s a good idea to have these on hand. Rotary cutter (optional). Not necessary, but makes cutting your fabric go faster. If you go this route, you’ll also need a mat. Pins. You’ll need plenty of pins. I prefer glass head ones because they won’t melt under your iron. Pattern weights. Use these to hold the pattern on your fabric while you trace it, or while cutting with a rotary cutter. Marking pens or chalk. Choose one that stays put and shows up easily on your fabric, but washes away cleanly. Machine Needles. Look for a size 80/12 for medium weight fabrics or 70/10 for light weight fabrics in either universal or microtex points. All purpose thread. You’ll need all-purpose polyester or cotton thread to match your fabric. 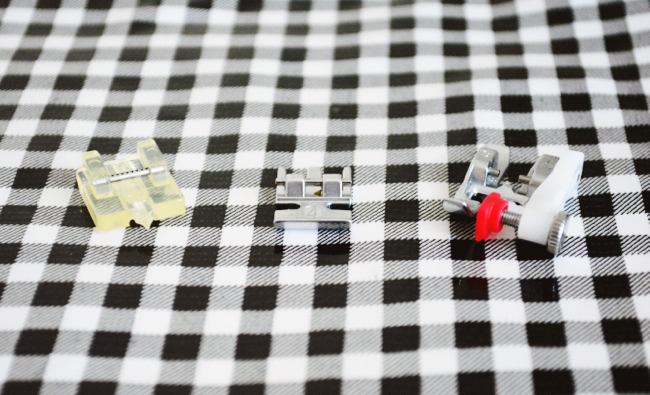 There are three presser feet that will be useful to have while making your Dahlia. The first is an invisible zipper foot (left). While it is possible to install an invisible zipper with a regular zipper foot, it is so much easier to do it with an invisible zipper foot. The bottom is grooved so that the teeth of the zipper unroll as you stitch, guiding the needle to sew precisely in the right place. Be sure to get the appropriate foot for your make and model of machine. You will also need a regular zipper foot for the zipper installation (middle). These generally come as part of a machine’s accessories. Before we begin, you will want to prewash your fabric in whatever manner you plan on caring for the finished garment. This is not something you want to skip, as you don’t want your dress to shrink after you’ve invested lots of time and effort into it. If you’re sewing with a wool, you can take it to the dry cleaner before you cut into it to have them pretreat it for you. You can also safely hand wash most wools with tepid water and a delicate detergent. It’s always a good idea to wash a test swatch first just to be sure. 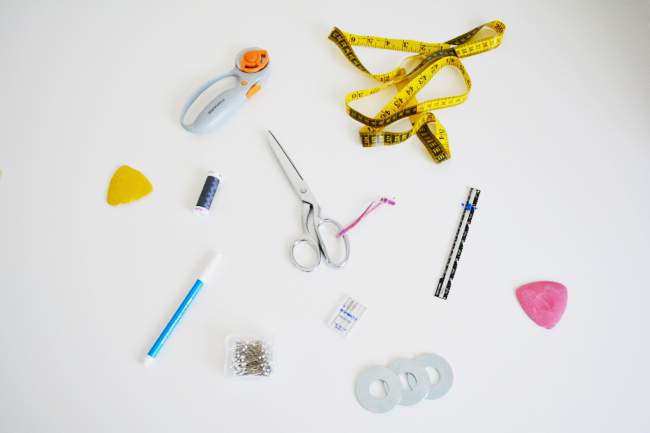 Do you have any questions about fabric, tools, or supplies? Let me know in the comments! Two questions — should we be making a muslin? Also, is any medium weight cotton flannel okay to use? These seem to be not as scratchy as the wool. Hi Alison! It’s always a good idea to make a muslin, especially at least of the bodice. Sometimes I like to do a wearable muslin out of more inexpensive fabric that’s the same price as muslin would be, but then I get a finished dress if it works out! This coming Monday the 10th I’ll be talking about some pattern adjustments you can do, so you might want to hold off on the muslin until after that because it could help inform your muslin making. And also yes, medium weight cotton flannel would be great! Thanks — For my muslin, I am tempted to use some cotton fabric I found at a flea market. It was probably intended for quilting, but maybe it’ll work out! Yeah that would be totally fine! What is the minimum amount of fabric we’ll need ? This dress is beautiful and I’m excited to get started! This is a great fabric overview. Very helpful for a nervous novice (me!). 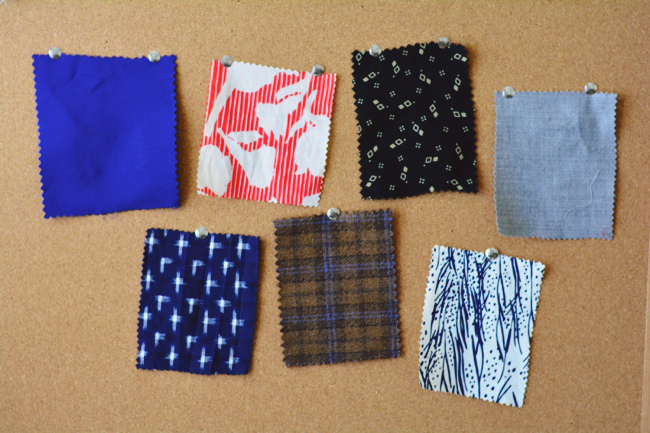 I am tickled that a fabric I was stalking this morning (the plaid cotton flannel) showed up in this post. Must be kismet. I am also curious about whether a muslin is a good idea. Yes, if you’re in doubt about fit a muslin is always a good idea! Hi there, Thank you for this very clear post. I’ve got one question: is it possible to add a lining at least on the skirt? Hi Pauline! I’ll be briefly covering adding a lining in the zipper post. Hi! I’m really excited to make this :). I was wondering whether quilting cotton would work? Will you be covering a lining during the sewalong? I think a lining would be a good idea for version 1. Yes! I was wondering the same thing too- I recently bought a class on Craftsy regarding all things lined and so I’m excited to put what I learn into use! We’ll be talking about adding a lining in the zipper post. Thank you for providing the adjustment date in your response to Alison. This is my first Colette pattern and I want to use all the wonderful advice that you provide and not jump in too soon. I have one question: I have only ever pinned and cut my patterns with shears. Is there a tutorial that I can access regarding using weights and methods of tracing? You can most certainly use pins and shears if that’s what you’re used to using! I don’t know if I’ll be able to keep up with the schedule, but I plan to make a Dahlia in a satin polyester for the holidays: any tips for me on pretreatment / cutting / raw edge finishing etc? For cutting, I find that a pattern weight/rotary cutter setup works the best for slipper fabrics. Depending how wiggly the fabric is, it might be easier to cut the pieces through a single layer – just keep in mind that means for all the fold pieces you’ll have to trace the pattern piece onto the fabric, then mirror-flip it over the fold edge to create the whole piece. If your fabric is wiggling a log, try taping down the corners and selvage. You can also put the fabric between two layers of tissue paper to keep it stable. Remember to keep your iron on a lower setting for the polyester. 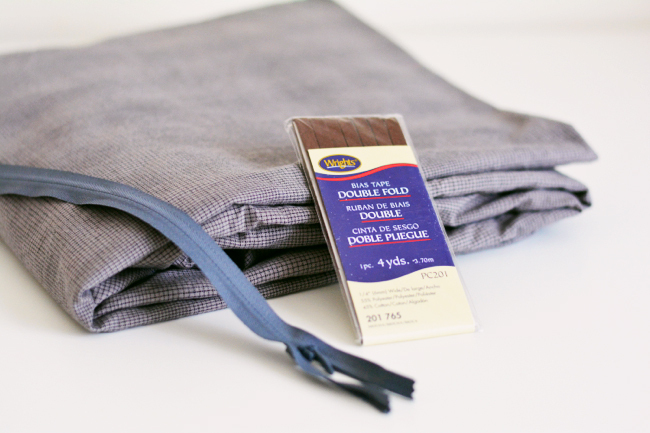 I’d also use a press cloth between the iron and fabric. I would love to do a wool plaid but know is completely screw it up with lining it up right and stuff so I’ll probably be doing a cute print or plain. I’m so excited. I was planning to do a muslin as well because I’m like an 8, 10, 12 from top to bottom and short so the back measurement will be nutty. Hi, could baby cordorey work for this pattern? (the version of dahlia with longer sleeves). Baby cord – what a great idea! I have already considered the wool flannel in charcoal plaid from Mood that it the first fabric in the suggested fabric options. I ordered a swatch and it appears to be medium weight and too thick for gathers. Maybe, lighter weight wool flannel/suiting would work better? I didn’t know that medium weight cotton flannel is also suitable for dresses and not just pajamas and shirts. It will make it easier to find a cute plaid fabric. Thanks! Yes, cotton flannel would be fine. I think quality is important though – to me really cheapy flannel is the kind that looks like pajama pants. But there’s plenty of cotton flannel that would be fine. I personally like the Robert Kaufman Mammoth flannel, I love how it feels and I think the quality is great. Can I just clarify the flannel choice of fabric please? This is only my 4th garment and I’m a bit confused. Flannel as in pyjama fabric? Really? Hope I haven’t got the wrong end of the stick because a dress that feels like pyjamas sounds amazing! I’m very excited to be joining the sewalong. Thank you. Yes, flannel as in pajamas flannel. It’s easy to associate flannel with pajamas, but remember it’s also used for other clothing items – flannel shirts and jackets are pretty common! So it would be fine for a dress. I personally would look for one that isn’t extremely fuzzy so that it doesn’t become a lint magnet. I know the pattern is intended for wovens, but do you think a ponte knit with very little stretch would work? It seems to have great drape, and I’d love to use the dress for travel. Should I find a knit with similar drape to make the “muslin?” (I’m an experienced sewer and have been pleased with Colette patterns in the past, but generally need to make them longer-waisted.) Thanks! Yes, I think it could work! You might want to consider reducing or getting rid of the gathers, since the stretch will help add in some fit. You may be able to just ease the gathers around the waist yoke into the yoke – I’d reinforce with clear elastic. Also, the neckline is on the slightly wider side, so you might want to draw it in a bit higher to anticipate stretching. I think it could be really cute and comfy! Thank you so much, Devon. I wouldn’t have thought to alter the neckline, but that’s a good suggestion. Also, I haven’t worked with clear elastic, but found the tutorial, which will help. Think I’ll get some more fabric and practice! Looking forward to more of your generous expertise! Pulling in the neck line is the very problem i will need help with. I have narrow, thin shoulders. I’m very much a novice sewer (my experience so far is limited to a couple of those simple elastic-waist skirts for little kids) and am very excited to (finally!) try my hand at a dress! I’m using a hand-me-down machine that has only the standard foot—no zipper foot (and it’s not possible to get one for this model). Can I still sew this dress without a zipper foot, or am I better off filing these instructions away for when I upgrade my machine (I have my fingers crossed for a Christmas surprise)? Also, I’d just like to second the vote for mods already mentioned in earlier comments: lengthening the skirt, and adapting the bodice for a small chest. If this is your first invisible zipper, it will probably be pretty frustrating without at least a zipper foot. I’ve personally never put in an invisible zip with a regular foot, but I did find this blog post from someone who did! I think the key is to press the zipper nice and flat so that you can clearly see where you need to sew. Thanks so much for the reply, Devon! I will definitely take a close look at the zipper-with-a-regular-foot post! There is also the option to hand-pick your zipper. Probably not something a real novice would try, but professionals sometimes do this. Thanks for the suggestion, LadyD! I just googled “hand picked zipper” and though it looks a bit more difficult than machine sewing in a zipper (especially for someone like me, who really struggles to keep a straight line with hand sewing! ), I might actually be able to manage this! Please show a FBA with this sew-along, I beg this of you. I’m a really weird fit with a very large bust and a very small rib cage but then wider hips. I really want this dress to work so I’m going to start fiddling with a muslin immediately but any advice you can offer would be a Godsend! There is a bust adjustment post scheduled for Monday the 10th. It’s actually not too much different than a regular FBA. For your hips, you can always cut out to a larger size from the waist to the hips on the skirt pieces, since all the pattern lines are nested. Zo it’s no problem to take a smaller size for the bust and a larger for the shirt? I’m so excited to get started on this dress! I actually have a medium weight purple plaid in my fabric stash to use for this although I think I’m going to do the waistband and binding in black to break up the purple a bit. That sounds really cute! And hooray for stash sewing! I am in the Southern Hemisphere and was thinking of making version 1 with a cotton broderie anglaise which is of a medium weight and perhaps lining it. Would this fabric have enough drape and be suitable for the pattern? It sounds like it would have enough drape [and it sounds like it would be very pretty!] You probably want to underline it as opposed to lining it so that the seam allowances don’t show through the lace. Thanks for the tip Devon. I think I will go with that. The gathers might stick out a bit with silk dupioni, since it’s on the stiffer side. I am pear shaped and fair skinned in a very sunny climate (South Australia) which is coming into summer. So the bias straps are not really an option. Is it possible to convert the raglan sleeve into an extended shoulder or cap sleeve shape? For adjustments, a special request for help with sloping shoulders. I have heard that the dress is for a C cup.. will you be doing a SBA along with the FBA? I have seen from testers that there is a lot of material under the bust. Yes, all Colette standard size patterns are drafted for a C cup, and yes there will be SBA info as well as FBA info! Thanks for letting me know it’s drafted for a C cup! I will definitely muslin it then for an SBA. Devon, Thank you for your very thorough responses to others and nice to meet you. My lesson I take away from this is that I will skip a muslin but won’t use the most expensive piece of fabric for the first attempt of this dress. Looking forward to making version 1 and attempting to shorten the sleeves for Summer here in Oz. I really appreciate the thought and effort put into these sewalongs. I would like my dress to have the bodice from version one with the skirt from version two. Is there a formula or rule of thumb to use to figure out how much extra fabric I would need? Also- I really hope you will show how to raise the neckline later, I need a little more coverage. I would go off the yardage for Version 1 as a rough idea and that should be pretty close, although when you start combining views the best thing to do is actually lay out the pieces and see how much space they take up, because the yardage is affected by your fabric width and whether or not your fabric is directional. Thank you very much for the advice. I’m really looking forward to this dress and the sewalong process. This is exactly what I was thinking of doing with my version! I’ll be doing the same as I want sleeves but with a fuller skirt – am I right in assuming the waists will be the same size on each bodice/skirt set? I will be using an African waxed cotton. Yes, you can mix and match skirt and bodice. I know you are doing a bodice adjustment post on Monday (hooray, and thank you!) but I wonder if you have any general guidelines for when/how to try to adjust within a single pattern size or when to grade between different sizes for different body parts – if you follow. Should I pick my largest size body part and hope that the adjustments will take care of the bits of me that are too little, or is there a magic threshold where grading is the better route? What a great question! Fitting issues (especially how to diagnose them, in what order they should be done) are what make me most nervous. I usually start by looking at the bust. Colette Patterns are drafted for a C cup, meaning they assume a 3″ difference between your high and full bust measurements. So that can inform you on what size to choose there. If your different is less than 2″ or more than 4″, you’ll probably want to choose your size based on your high bust measurement [so pretend your full bust is 3″ bigger and choose that size] and then do a bust adjustment. From the size you choose at the bust, you can then grade in/out to the waist and hips to the sizes you fall into there. When you do a bust adjustment, you don’t actually change the finished waist measurement, so if you grade in or out to a different size at the waist then it should remain intact even after the bust adjustment. Thank you! Combined with your earlier post on SBA (which I could have found before if I had thought to look), this is extremely helpful. Looking forward to starting! Perhaps this will be covered in the next segment, but I thought I’d ask in advance. With respect to sizing, my bust suits size 2, waist size 4, hips smaller than size 0. I’ve cut my pattern pieces to suit the waist size. Do alterations/modifications happen before cutting the fabric? Thanks so much for this sew along! You can actually cut between sizes on the paper pieces before you cut out your fabric. So you would blend from the size 2 line at the bust to the size 4 line at the bottom of the bodice. It will be covered in more detail in a post Monday. For the bodice, you should be able to lay the paper piece back over the fabric and trim it down. There are some pieces where that wouldn’t work – like the yokes – where the nested lines of the smaller sizes are actually to the outside of the larger sizes, meaning they got cut off. Thank you very much, Devon. It’s so lovely to get all of this free instruction – so kind! I purchased some wonderful cotton plaid today. It is all washed and ready to go! I’m fairly new to sewing, and I am hoping someone can recommend a good iron. My $10 Black and Decker just isn’t cutting it. Thank you! I actually have a $30 Shark brand iron from Target that works just fine. It’s not the most amazing thing in the world but it does the job [and has an auto shutoff, which means I don’t have to worry.] I’ve also used Rowentas, which are definitely better/heavier/hotter/stronger irons, but they are a bit pricier. Sorry that that’s not very specific, maybe someone else will chime in! I’m planning two Dahlias, my final in a wool chiffon I just splurged on yesterday, and my first, a wearable muslin in a lightweight cotton… something (faint stripes, looks/feels a bit like raw silk). The wool will definitely need to be underlined, and possibly lined as well (depending on how opaque my lining is). The cotton is light colored and a little scratchy, so I was thinking I would line or underline it, too (would also give me practice) but not both. Any suggestions for which? I would say to line it, because it will look so nice and finished and smooth on the inside, and also it will give you a first go at the process of putting in the lining before you do it on your fancy and delicate wool. Thanks! Two followup questions re the wool chiffon–suggestions for the underlining fabric? The lady at the fabric store where I bought the wool chiffon suggested Ambiance liner, which seems nice for the actual lining but I guess was thinking something more substantial for the underlining–I want it to look/feel more wool than chiffon, if you know what I mean. Second, I usually do handmade bias tape, but would that work if made from the wool chiffon? Or will it look weird since it is a bit sheer, and/or will it not be strong enough? Finally, would there be a way to add a bit of elastic to the sleeve ends, to gather it in a bit (but still make it easy to get on/off)? Thank you! A lightweight wool suiting might be good for the underlining if you want it to still be wooly. As for the bias tape – the chiffon would be incredibly finicky to sew, but I’ve read before of people spraying it with a few light coats of spray starch before cutting and sewing it. Spot test first though! Especially starching and then pressing. I don’t think the see-through aspect will be bad, as long as all your edges are neatly trimmed before they get sealed up. It will just be really tricky to cut and sew. For the sleeves, you can just fold under the bottom edge to create a casing (basically a little hem) and thread some narrow elastic through. Size the elastic around your arm so you know how long to make it. and maybe do a little test swatch with all the layers and a small piece of bias chiffon first, so you’re sure you like it and feel ok about doing it before you start in on the actual neckline of your dress. I am so looking forward to creating such a stylish dress for myself. I’ve found several choices of fabric in my stash which I’d like to practice with to make several wearable muslins. This is my first sew along and also my first Colette pattern and I’m really excited to be taking part in all of the lessons. Glad you can join in!! Got my pattern this week, looking forward to making it, I was thinking about making a cut off version, like a raglan t-shirt, do you think this would work in jersey? Yes I think it would work, although the neckline might be a bit bigger that it looks in the woven because it will stretch. And depending how baggy/not baggy you want it to be, you may want to size down. I’m thinking of lengthening the sleeves… would it be just a case of finding an existing sleeve pattern that I’m happy with and combing the bottom half with the Dahlia sleeve? thx! Sure, you could do that! Or your could just continue the side edges of the sleeves down to the length that you want them. The bottom edges are finished with 1/4″ bias tape, so there’s no hem allowance, so remember to add that in if you’re going to hem them instead. What kind of fabric is your version 2 made from? Do you mean the version 2 sample? It’s a black rayon. Dear Devon. Thank you for this helpful post. I have bought a fabric who looks like wool but it’s a synthetic/viscose medium weight fabric. Nevertheless it’s a little bit stretchy. Is this detail problematic ? Looking forward to the sewalong! I got a chocolate brown cotton flannel with a subtle herringbone print. Do you think that is something that would benefit from pattern matching? If it is subtle and small, I wouldn’t worry about it! Sure! You can tape some paper under it and use a ruler to draw in the neckline a bit higher. Then you’ll want to add the same amount to the sleeve pieces. The easiest way I find to do this is to measure the amount you’ve added at the raglan seam line and make sure to add the same amount at the seam line of the sleeve. The back neckline is already fairly high (or ‘normal’ if you could say that) so you might try adding to the front and then blending the top of the sleeve piece to its existing height at the back. Sure, you can use the notches if you want. You can put the line wherever you want, depending on your fabric. The line is just where you want a certain point of your fabric design to line up. Like if your plaid has a really bright stripe that you want to match halfway up the raglan seam, then that would be where you put your line – halfway up the raglan seam. You just always want to make sure the line is perpendicular to the grainline of the pattern piece.